The season is coming to an end, make sure you have unlocked everything you want! Check out the all-inclusive cheat sheet below to get them done nice and easily! Eliminate Opponents (Tomato Temple) – Quite popular now, I would suggest landing by the tunnel – usually good loot here, also gives you a good vantage point on most opponents in the temple. Deal Explosive Damage (500) – Easy enough, if you are struggling then jump in duo or squads and hit downed opponents. Collect Treasure – Navigate to square F7! Assault Rifle eliminations – Easy again, play the game and this will be done in no time. Search Different Stones – Mix up your drop locations and it’s easy enough. 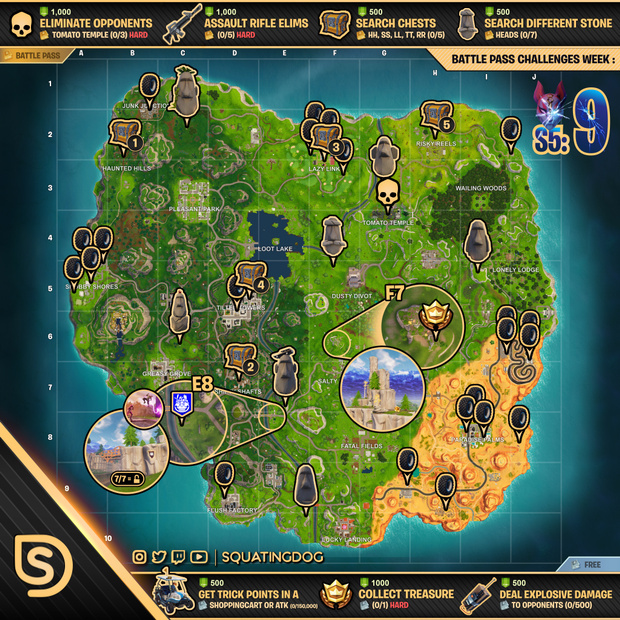 Trick Points (ATK or Shopping Cart) – Head over to Lazy Links, grab a cart, easy game. Happy hunting and building, and as always if you’re not sure which one to do first? Sping the WheelOfFortnite !